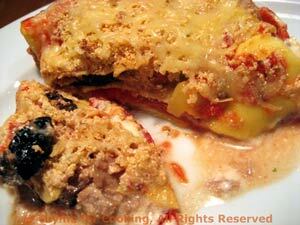 Tuna and Chevre Lasagne, Thyme for Cooking gourmet recipes. Fry some carrots while the lasagne reheats to round out the meal. Remove from fridge and reheat. The first time I made Beef Provencal the recipe instructed to fry the carrots before adding to the stew. They were so good, I started frying them just a bit longer and eating them on their own. 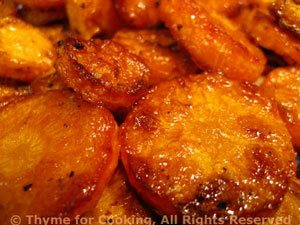 It caramelizes the sugars and turns them golden and sweet. Peel and slice carrots into 1/4 inch thick (.65 cm) rounds. Heat butter and oil in a large nonstick skillet over medium heat. Add carrot slices in one layer. Let fry undisturbed for 8 - 10 minutes. Check one after 7 minutes to make certain they're not getting too brown. Turn them over and fry the other side. They should be getting a few light brown spots on them where the sugar (from the carrots) is caramelizing. Fry another 7 minutes then check again. The second side will brown faster than the first. When they are done to your liking, remove to a paper towel to absorb the excess oil, sprinkle with salt and pepper and serve.